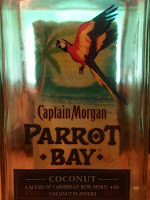 Captain Morgan Parrot Bay coconut flavoured liqueur. Quite a mouthful. While the bottle in front of me looks a bit different then the one the left (see bottem picture), the caribbean rum based spirit inside should be about the same. Where the bottle in the left is 24% alcohol (48 proof) the one in front is me is 20% (40 proof). And it has to be said, i do like the bottle design, especially with the beach concept printed on the inside of the sticker on the back. The spirit itself smells mostly like sweet coconut, and has a tiny little bit of a rum smell mixed in there aswel. On the taste side, about the same. 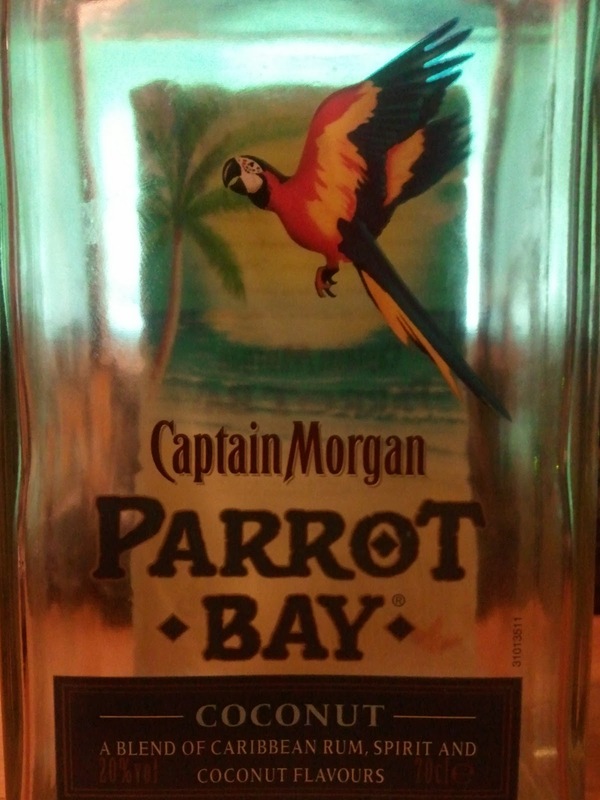 It begins with a sweet coconut taste on the tip of the tongue, adds a tiny little hint of rum again when it goes to the back of the tongue, to finish with a slighty warming sensation down the throat. Mixed the rumlike features will disappear and you will get a mellow coconut result. All in all, i have nothing bad to say about this spirit, no offensive tastes, smells or other attributes, but a rather nice smooth spirit in a fancy bottle (found for about €11,- for the 70cl bottle). It is quite drinkable on its own, but, it is sweet, so for most people this will probably end up getting used as a coconut addition to rumbased cocktails, which works absolutely fine. Captain Morgan website right under this link, yawr! 0 Response to "Parrot Bay Coconut"